As summer approaches, you may be looking for ways to make your neighborhood, town, or city more fun and engaging. If you are, our friends at CommunityMatters have a ton of ideas for way you can do that! CM recently shared two posts (here and here) with ideas for making your space more engaging and out of the ordinary. So to help give you food for thought for the summer months, we put the lists together below. They also hosted a conference call about it called Creating Fun Places that you can listen to here. We hope these ideas will get your creative juices flowing and help you make your summer more interesting! Thanks to CM staffer Caitlyn Horose for putting all of these together! What’s more fun than a colorful piazza? Drats! We need one more idea to get to #75. Help us out by sharing your thoughts in the comments below! Add cheer to the streets with tiny notes. Host a temporary tattoo parlor. Stop standing and start sitting with bench bombing. Start a bell box mural project. Build a treehouse for grownups. Use scaffolding as a place to linger. Create a mini golf course in an empty parking lot. Remind strangers that they are beautiful. Play around with baggage carousels. Install temporary, lego-like bike lanes. Fill your city with friendly robotic trash cans. 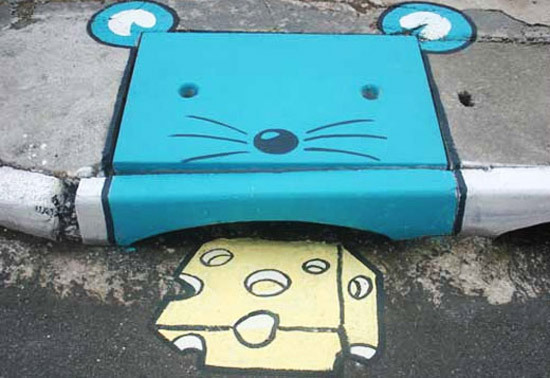 Have a little fun with curb-side sewers. Still hungry for inspiration? Listen to CommunityMatters’ conference call on Creating Fun Places, featuring Mike Lanza of Playborhood and Brian Corrigan of Oh Heck Yeah. Thanks for posting! We’d love to hear other ideas and examples for creating playful places, or making engagement more fun and playful! You’re welcome, of course! Thanks for making the list in the first place 🙂 Where should folks reading send their ideas?